It's starting to look a bit like Fall around here. I planted some Fall flowers in the window box on our side porch. I love adding small pumpkins or gourds to my Fall planting. I like the color and texture, and it helps to fill in the bare spots when the flowers haven't filled in yet. And the window box is complete. I need to put some mums and kale in my other pots, but now my geraniums and lantana that looked so withered and pathetic during the hot summer have come back to life, and I don't have the heart to rip them out just yet. Does that ever happen to you?? YES!! It happened to me this year! I waited and waited for my geraniums to wither away so I could put mums in their pot but they just kept getting blooms. So I took the geraniums out and put them in a temporary spot in one of my flower beds. 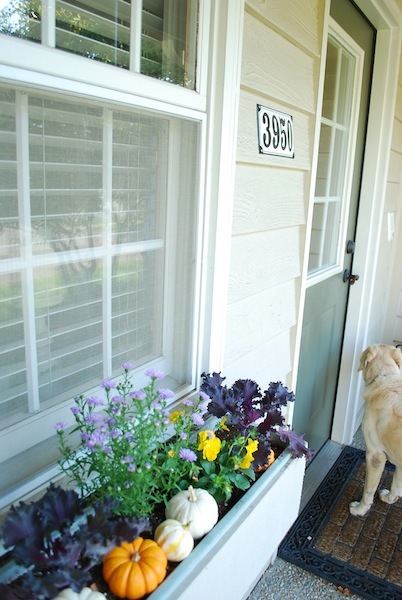 I needed mums in those planters to help the fallish feel on my front porch. I love the little pumpkins and gourds in your box. I may have to try that! I love window boxes. Yours looks great! I love the mix of orange and white pumpkins and the purple flowers. I don't have a spot for a window box, but I always envy then when I see others'. Yours is just lovely! That's exactly what I did...just plopped in some pumpkins among what was already in the box...and then added some fake leaves..from the street...the leaves look real and add some nice fall color! Your box is perfect! Looks pretty. Yes - my geraniums are still alive on the balcony. I had planted them with some creeping jenny which is now turning brownish from the cold (but still looking alive and healthy!). I feel like they don't go with the mums on the front porch, but I can't kill them yet either! Looks like someone is waiting to enjoy that pretty Fall "snack"! Looks terrific, Carolyn!!! Love the kale - it will hold you through the winter nicely. Carolyn, your pictures look so pretty. I just got a new camera and I'm learning how to use it. fabulous look!! the pumpkins are a great touch! So pretty - always one of my favourite things to change up planters and window boxes. Can't wait to get my own place again someday - apartment living certainly takes the fun out of seasonal decorating. Your flower box is beautiful ... the purple is a nice surprise. 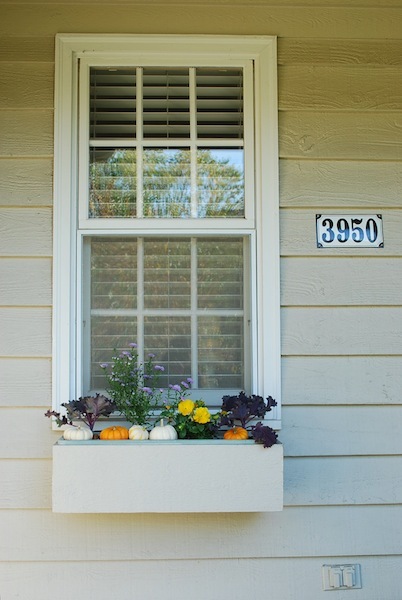 Love your window box idea with the pumpkins! Gives me an idea for mine! :) Great blog. Your growing kale. I love kale. What's really good is cutting up kale then cooking it with lard. This makes them into fresh fries in a way.